Vacations are well-deserved and are quite important too. However, whether your planning on travelling to France or visiting the Grand Canyon, money shouldn’t come in the way of your moment of relaxation. Now, you may be thinking: Easier said than done when you’re in a sticky financial situation, right? Or, you may catch yourself thinking “I need money now with no hard credit check” because you think this is the quickest and easiest method to taking care of your financial problems. 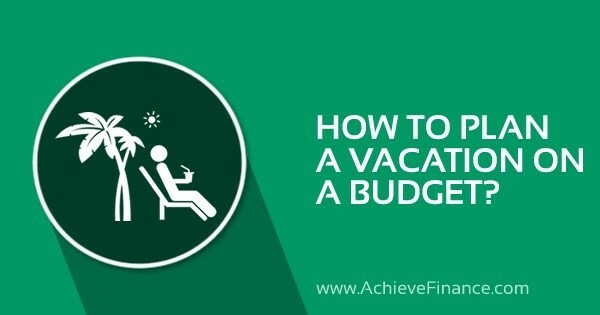 Instead of racking up more debt, causing more financial problems and stressing over money issues, check out these tips on planning a vacation on a budget! If you take these following tips into consideration, you’ll have better chances at planning a vacation on budget and avoiding money problems along the way. When it comes to saving money, exchange rates are of great importance, and going about obtaining them is rather key. You’ll receive the best rates at your destination and most likely at a bank ATM. As a general rule, foreign banks offer lower exchange rates than commercial exchange counters. Keep in mind that you should only ever exchange the total amount of money that you can spend from your budget. You’re better safe than sorry – avoiding extreme ATM and transaction fees by calling your bank or credit card provider prior to travelling out of country or state. Moreover, credit card companies will usually freeze your funds if using in a different state or country for they will believe your card has been stolen. If you want to avoid getting caught at the restaurant in Cuba with a useless credit card, then make sure you make those necessary phone calls before leaving. It is important to set yourself a daily spending budget. This includes food, drink, activity and souvenir expenses. As a rule of thumb, this number should be increased by approximately 15% in order to avoid any problems or emergencies. Moreover, it is important to have planned ahead and subtracted the cost of transportation and hotel from your overall budget. A great tip to sticking to your budget or otherwise known as the “cash diet” is by putting your daily allowance aside in separate envelopes. Everyday, only take out one envelope and only use the contents inside. Doing so avoids using your credit cards, aside for in an emergency. Keep in mind that psychologically, foreign money doesn’t feel the same as regular money. In most cases, we don’t have the same association in spending it, or we feel as though it is of a lesser value. It’s important to respect the amount you set aside for daily budget and not blow it all away on one item or one store. Take a trip to a Pacific island for example. Alright, it costs a hefty price to reach the destination however, you’ll probably find a few great hotel rates and easily save money by attending low cost beach activities. It is always important to keep in mind that your trip shouldn’t be overly expensive in all three areas. Of course, you want lasting memories from your vacation and one of the most common ways of doing so is by purchasing souvenirs. However, before purchasing another dust-collector, question yourself on the need for that specific item. If you’re going to purchase souvenirs at your travel destination, than my as well get a bang for your buck and choose something that’s useful in the home or fits according to your decor. Furthermore, you can even plan your yearly purchases based on your upcoming vacation. For example, if you know you can get a really good price on a silk scarf in Thailand where your traveling in a few months, then it’s useless to buy an expensive one at home before going. More so, you can also consider purchasing a camera or taking more photos of your vacation instead of purchasing tons of stuff while at your destination! Sure, we know how tempting it can be to purchase gifts for family and friends. However, it’s also important to keep your budget in mind. It may be nice to offer such presents, but always remember that there is absolutely no need in doing so. If you absolutely want to purchase gifts for people while on vacation, than make a list of the family or friends you plan on buying for ahead of time. To this list you can add how much you’d like to spend on each individual. When you find a store that offers many items on your list, buy in bulk and try negotiating a rebate. Again, stick to your budget plan! Avoid having to purchase extra luggage at your destination by planning ahead of time and leaving a little extra space in your suitcase to pack the new items you purchased. Depending on your travelling means, you may be allowed a carry on so consider bringing a small fold-up bag in your luggage for your way back. Do like the locals do! Street food, inexpensive cafés, restaurants and even local markets are going to cost much less expensive than any hotel buffet. On top of saving money, you get to discover the true taste of authentic, local cuisine. Breakfast, lunch, supper and snacks can all become less expensive by avoiding the food and restaurants directly related to your hotel chain!